Spize Café had been near the top of my list of places to try for quite a long time. 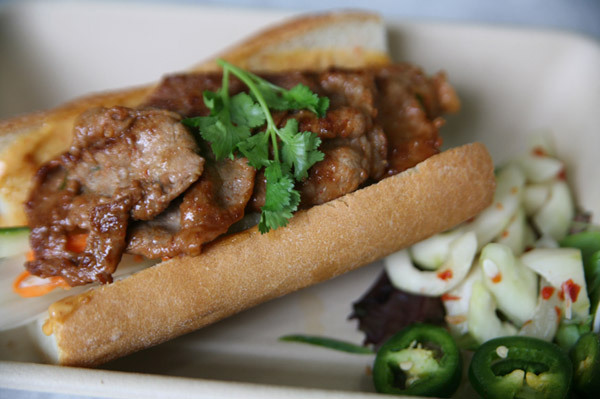 Their eclectic Asian menu appealed to me, and I’d heard lots of good things about their baguette (banh mi) sandwiches. Having finally tried it, I can’t wait to go back. It’s not the most exciting place to eat; though the décor is sleekly modern and minimalist, and large plate glass windows line one side of the space, the restaurant’s location on Fayetteville Street in downtown Raleigh marks it as more of a take-out lunch spot for the masses of office workers and state employees. Indeed, on a recent Friday evening, the place was virtually deserted save for a couple of extremely friendly staffers. I ordered a lemongrass pork baguette ($7.95) and my wife opted for the shrimp version (also $7.95). They were cheerfully brought to us after a brief wait. The sandwiches were gorgeous and overflowing. Mine was stuffed with thin slabs of grilled meat, lettuce, cucumber, carrots, mayo, jalapenos, and cilantro, and served on a delightfully crunchy, crusty baguette. It was excellent. Even with a few jalapeno slices, and despite the restaurant’s name, the sandwich was not particularly spicy. The one knock I would give Spize Café is a paucity of side items. The sandwiches aren’t small, but it’s nice to have something to go with them. Mine came with one sweet-spicy pickle, which was delicious, but it was about the size of my thumb. I’d much rather have a small bowl of those than resort to a little bag of potato chips. Regardless, I hope to come back again and again for some of the best sandwiches in Raleigh.